I really have an issue with how Chronos is importing my grade variables from the Maptek Vulcan dmp file into the Maptek Vulcan Chronos workbook. My gold and silver grades are stored in a ‘float’ type variable in the block model. The advanced reserves editor reports out sixteen decimal places for the weighted average metal grade. I know this because I can see it when I open the dmp file with a text editor or the csv file with Microsoft Excel. What happens when I import this data into Chronos is, it throws away twelve of the decimal places and only carries four decimal places for the gold and silver grades. I’m sure that someone, ‘back in the day,’ thought that four decimal places would be more than enough. If we were working with tonnage or volume or dollars or any other sum type variable, four decimal places would work fine, but we’re not. We’re working with grades, and now we have lost twelve significant figures. 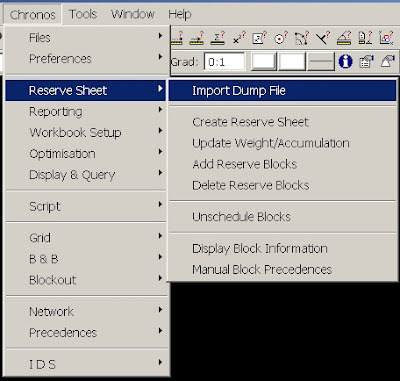 It should be easy to point to differences between the dmp or csv advanced reserves output and the final schedule from Chronos, but it’s not. The first thing I do after importing data into a new Chronos workbook (Chronos > Reserve Sheet > Import Dump File) is multiply the ore tons by the metal grade to show contained ounces in its own column. These contained ounces are used to calculate recovered ounces and reported out in the period summary of the completed schedule. I also compare them to the same column in the csv output from advanced reserves. Now I have some explaining to do because they don't match. If I have a million ounces of metal in my schedule only the first four significant figures will be correct (1,000,???). That means that I am hundreds of ounces different from the csv file that is my quality control check. The total tons and volume are correct to four decimals but all of the grades are only sort of close. It took a long time to explain to my boss why the grades have a rounding error of several hundred, while the ore and waste tons had a rounding error of several ten-thousandths. Can we please increase the accuracy of imported data in Maptek Vulcan Chronos? Vulcan is already exporting the data. The csv and dmp files can contain all the significant figures why can’t we import this same level of detail into Chronos? You could convey main idea of the article expressively. Also, the writing style followed in the article is appreciative. I thoroughly enjoyed the article very well. I have read each and every line of the article very carefully. Thanks for sharing this interesting article with us! Looking forward for more updates! Keep your research paper bull crap to yourself. Let kids cheat their way through school on their own. This can be definitely exclusive perform the job. Appreciate it on your time period intended for publishing this crucial points of your blog site. That definitely price cut allow achievement. Thanks for the purpose of featuring numerous useful tips from the blog site. Cool gadgets abide by that itinformationtechnology Thanks drastically for the purpose of quality organize.